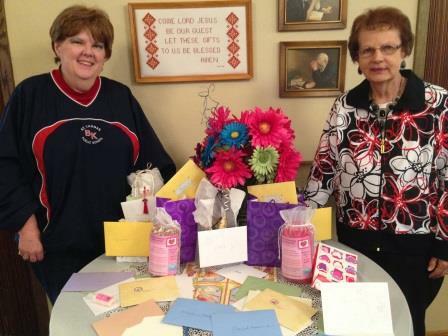 Bethel Free Lutheran WMF, Grafton, North Dakota, hosted a “Done with Chemo Party” last Thursday for two dear ladies, Carol Hensrud and Maxine Larson. In the early autumn days of 2013, both were diagnosed with cancer, and faced a long winter filled with chemotherapy. Their church and WMF friends watched as their faces grew pale, their hair thinned and fatigue became the way that they started every day. We sent cards, called with words of encouragement, offered rides…but felt helpless as we watched our dear friends struggle with yet another round of chemo. How many weeks left, we would ask? Eleven more weeks, nine more weeks…then finally one more week! At last they were done, and we rejoiced! However…we wanted them to know just how much we loved them, and how happy we were that their chemo was completed. So, we decided to “shower them with love” at our May WMF meeting. The Fellowship Room was decorated with flowers and balloons. We brought cards and presents…and waited for them to walk through the door. “Surprise!” we yelled as they entered. “What is going on here,” they gasped as they looked around. “We are having a Done with Chemo Party,” we told them. The room was filled with laughter as they looked around in disbelief. WMF opened that evening with a rousing chorus of, Count your Blessings, Name them one by One. We looked at each other as we sang…and know that each was a blessing…and that friendship was a gift. As we studied God’s Word that night…each verse…each comment…was precious. This entry was posted in Congregational, Relational, Situational and tagged Bethel Free Lutheran WMF, cancer, Chemo, ministry, Romans 12:15, Romans 15:13 by wmfes. Bookmark the permalink. Awesome! thanks for sharing, Esther! It makes me proud to be part of Bethel’s fellowship!